Modern Design Goes to School! 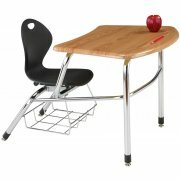 Teachers, students, and school administrators all agree - the attractive "future-ready" design on this Inspiration combination chair-desk is a very cool addition to any classroom.Inspiration classroom furniture also gets an A+ ergonomic comfort factor and top-quality materials that will provide students with dependable usage for many years. This combo desk's superb styling and superior construction add up to an exceptional value, and is ideal for creating cooperative education work/study group areas. 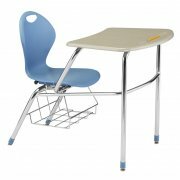 This product is a part of the Inspiration series of modern classroom furniture. Extra Strong: Underseat rivets, 14-gauge steel frame and 17 reinforcement ridges provide exceptional strength. 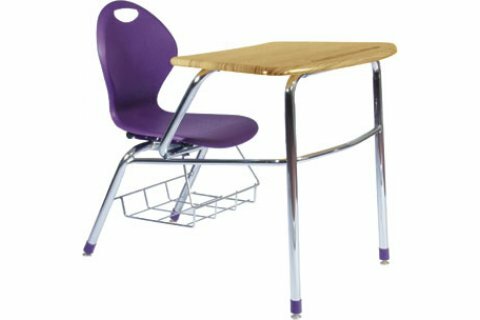 Comfortable: Flexible back lets students sit comfortably throughout the day. Attractive: Curved seat and matching boot glides make these chairs highly attractive. WoodStone Advantage: WoodStone tops offer strength similar to hard plastic, at an economical price. Optional Color-Match: We will match any plastic color for a 5% upcharge with an order of 500+ chair desks.